Over 400 interviews with Austrian home care service users were originally planned as part of the EXCELC project in 2016/2017. More than 600 have been carried out successfully. Data collection was supported by the Austrian Federal Ministry of Labour, Social Affairs, Health and Consumer Protection, by social care organisations and local authorities. More than 60 trained interviewers took on the task of visiting people in need of care in their own homes to conduct interviews. About half of them gave us detailed written feedback describing their experiences and their impressions. This blog is based on unstructured accounts of their experiences. Quantitative analyses of the data collected through the standardised personal interviews can be expected in September 2018. Respondents freely voiced their hopes and fears relating to their situations. Our interviewers were able to gain insight into the respondents’ lives and their care situations both through the interviews and the conversations that often followed. One interviewer happily noted: “the ladies were very vivid in their descriptions, it felt like they were sharing a part of their lives with me”. Some long-term care service users are quite affected by cognitive decay, memory problems, or are depressed or afflicted by other mental conditions. Others, however, have an active mind but are trapped in a frail body. They, for example, follow technological innovations and keep up with digital means of communication – such as Mr. S, who likes to download the newest apps onto his smartphone, or Mrs. M, who regularly uses Skype to make phone calls to her grandchildren living abroad. Digital innovations aside, they also get creative in other areas when it comes to dealing with the physical constraints they are facing. Mrs. L, for instance, makes use of a cord and basket to bring groceries and mail up to her first-floor apartment. The first important step – and often a challenge in itself – consists of coming to terms with one’s own need for care and in accepting help and assistance. Sometimes, this leads to a reversal of roles – as in Mrs. W’s case: she has spent most of her life caring for her physically disabled daughter but now finds herself in need of assistance because of cognitive impairments. While some people take a long time to come to terms with restrictions they face, others adapt to their new situation rather quickly. In the course of the interviews respondents discussed the process of adapting and adjusting to new circumstances. In many cases, these mechanisms are offered as an explanation as to why respondents are happy and doing well even in difficult situations. Our interviewers were often impressed with the respondent’s positive attitude and coping strategies. Care at home – not enough assistance? In many cases, our interviewers got the impression that the care services people received in their homes helped them a great deal – at least at first glance. Home care enables them to stay in their homes and help them overcome the obstacles and challenges of daily life. However, at second glance, it often became evident that the services provided only basic support and that some needs remained unmet. As our interviewers have observed, it is the social needs of care recipients which are left unattended. Care service recipients feel clean, well-fed and safe, but seem to lack interpersonal relations and meaningful interaction. Visits from care workers are a welcome change but time is short and the required paperwork often ate up the little time left that could be used for some conversation. Care workers are trusted and significant people in the lives of long-term care service users. This is especially true for persons living alone who don’t have many outside contacts – for them, visits from care workers can brighten up their entire day. On many occasions, interviewers have heard respondents talking about care workers using terms of endearment, speaking of their “fairy” or “wonderful Maria”. However, recurring changes in personnel and uncertainties about the times of visit are often causes of discomfort or insecurity for the care service recipients. A great deal of flexibility and patience is needed on their part to adapt to new schedules and new caregivers, requiring them to explain over and over again what’s important and what to watch out for. This creates a lot of insecurity, especially for older people who might not be as able to adapt to changes and have a preference for clearly structured routines. Some respondents with live-in caregivers have trusting and amicable relationships with them. Others, however, are less satisfied with their arrangements, voicing their despair and anger. Ideally, most care recipients would prefer a reliable, stable care setting. Finding a suitable live-in caregiver is difficult and full of obstacles, making the process difficult and tiresome. Moreover, even those who have found a live-in caregiver might still be faced with uncertainties, such as their care provider finding a more promising job and leaving them with no other option than to move into a nursing home. Financial strain, small pensions and a lack of means for taking up more care services are brought up and discussed. Thus, long-term care allowance (“Pflegegeld”) recipients became frustrated if applications for higher long-term care allowance had not been successful. Our interviewers noted that there tends to be a lack of information – many respondents don’t know about available long-term care services and ways of paying for them. Mr. P is one of those cases – he would like more social interaction in his daily life, but had never heard of visiting services or day care centres before the interview. Or Mrs. D, who was applying for care allowance for the first time and didn’t know who to turn to for assistance. There is substantial information available via the internet – but only a small share of those in need of care services have access to it or are web-savvy enough to use it for this purpose. This has been a selection of interviewer impressions from interviews with long-term care recipients in Austria. Results from the statistical analyses will be available in September 2018. “Understanding best-worst experiments for calculating quality-of-life preferences in long-term care settings: How they work and what to consider” (“Hinter den Kulissen – Wie funktionieren Best-Worst Experimente für die Berechnung von erwarteten Präferenzen bei Pflegebedürftigkeit und welche Faktoren beeinflussen die Ergebnisse?“)Assma Hajji gave an overview of the method used, the experimental design and methodological issues. The data was collected using a best-worst experiment for calculating preferences for different social care-related quality of life domains using the ASCOT questionnaire. “Food over company or vice-versa? Results from a best-worst-analysis of expected quality-of-life preferences in long-term care settings for Austria” (“Gutes Essen oder nette Gesellschaft oder..? – Eine Best-Worst-Analyse zu den erwarteten Präferenzen bei Pflegebedürftigkeit in Österreich”)Birgit Trukeschitz presented preliminary results of the Austrian preference weights based on a general population sample, showing some clear differences in preference between various domains of social care-related quality of life. Both presentations were well received and led to some insightful discussions on potential implications and next steps in the process. 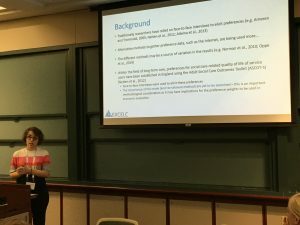 Two EXCELC team members presented their works at the iHEA World Congress in Health Economics held in Boston on July 8–11, 2017. 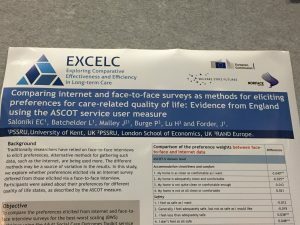 Eirini Saloniki presented early findings on differences in preferences elicited from internet and face-to-face surveys, based on data from a best-worst scaling experiment using the English Adult Social Care Outcomes Toolkit service user measure (ASCOT-S). 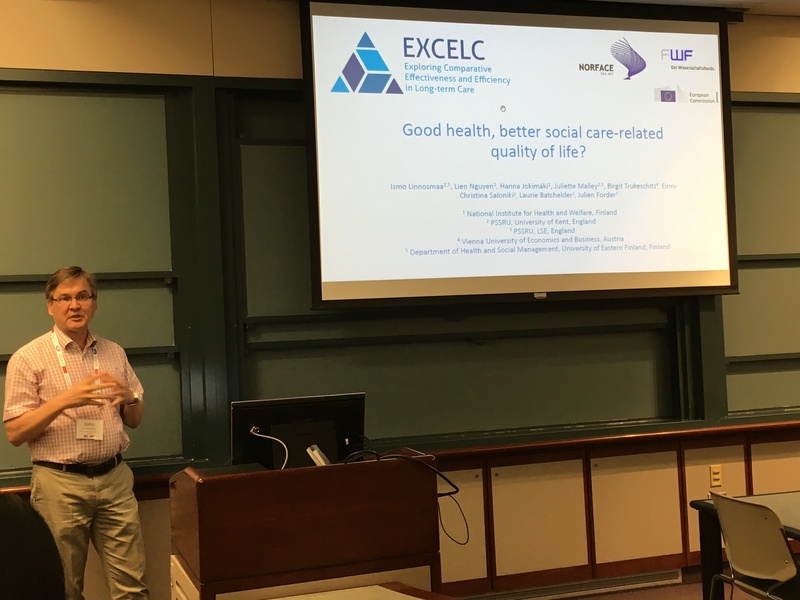 Ismo Linnosmaa gave a talk on our preliminary work exploring whether general good health leads to better social care related quality of life. Both presentations were well received. We are using the feedback from the useful discussions to refine our work. 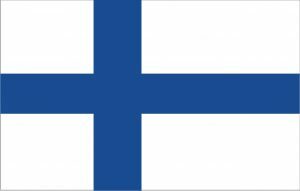 In addition to the iHEA Congress, the Finnish team submitted two written papers to the Nordic Health Economists’ Study Group Meeting (NHESG) held in Helsinki on August 23–25, 2017. 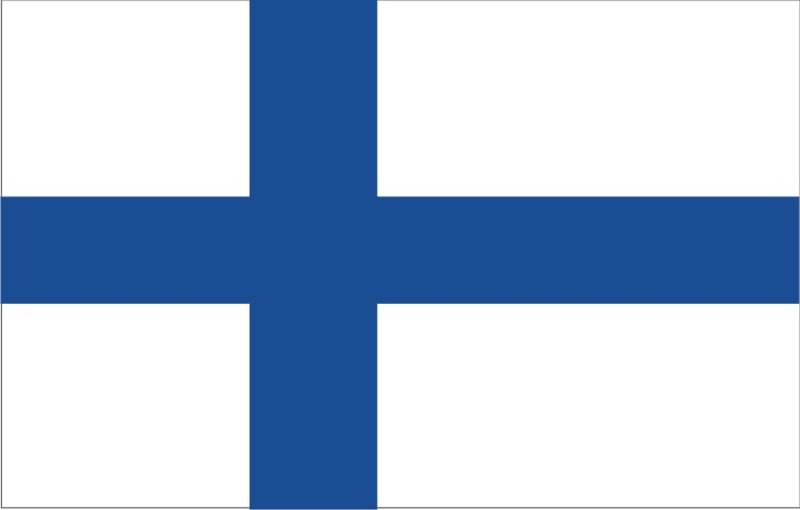 Ismo Linnosmaa submitted the paper on the relationship between general good health and social care related quality of life and Lien Nguyen submitted a paper presenting Finnish population preferences for the ASCOT service user measure. The discussants for these written papers (Professor Jan Aben Olsen, University of Tromsø, and Associate Professor Line Bjørnskov Pedersen, University of Southern Denmark) provided detailed and useful feedback, which has helped to further refine our analysis. Many colleagues showed an interest in our work and are looking forward to us returning to a future study group meeting with our final results. 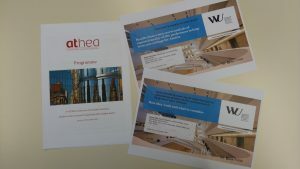 The iHEA (International Health Economic Association) World Congress in Health Economics is a biennial conference traditionally held in July. The NHESG (Nordic Health Economists’ Study Group) Meeting is an annual conference traditionally held in August, involving researchers mostly from Denmark, Finland, Iceland, Norway and Sweden. The number of researchers, including doctoral students that attend the Nordic conference each year is about 70–100. Written papers must be submitted to the conference organisers beforehand and 40 minutes are allotted to each paper for discussion, led by a discussant. The discussant will first summarise the paper and then give his/her comments on the paper, after which the paper’s authors can reply and the audience can join the discussion. 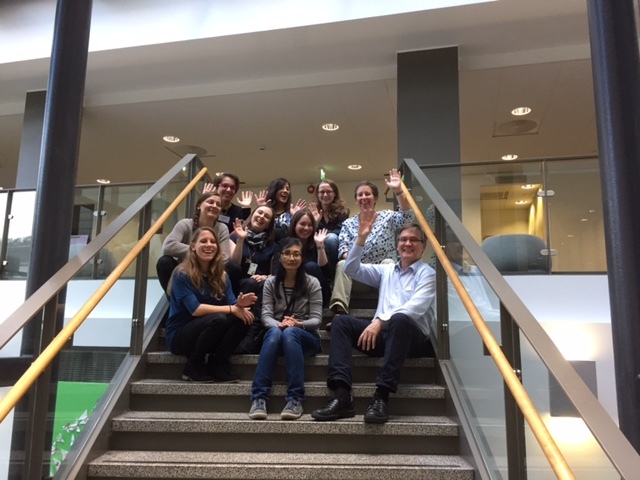 The EXCELC team caught up in Helsinki last week (5 – 6 October) to discuss progress to date with the EXCELC project and the next steps for the study. 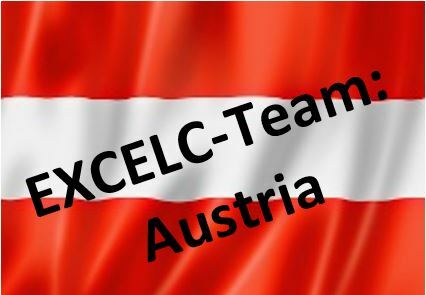 On Thursday, the EXCELC team discussed progress with the service user and carer fieldwork in Austria and Finland. Birgit Trukeschitz, Assma Hajji, Judith Kieninger and Judith Litschauer reported that they have nearly completed the Austrian fieldwork (with only a few interviews left) and presented descriptive results. 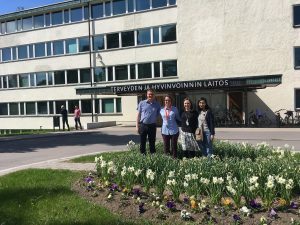 Ismo Linnosmaa, Lien Nguyen and Hanna Jokimaki finished their data collection for the Finnish fieldwork and also presented descriptive results. We discussed various options for analysing the data collected from the fieldwork and constructed a workplan with several streams of analysis. After the meeting, the Finnish team led us on a walking tour of Helsinki and gave us the opportunity to try some delicious Finnish cuisine sourced entirely from Finnish suppliers! On Friday, Laurie Batchelder and Eirini Saloniki presented results from the preference study, which included models for England for the ASCOT carer measure and models exploring the effect of preference elicitation methods on preferences for the ASCOT service user measure. 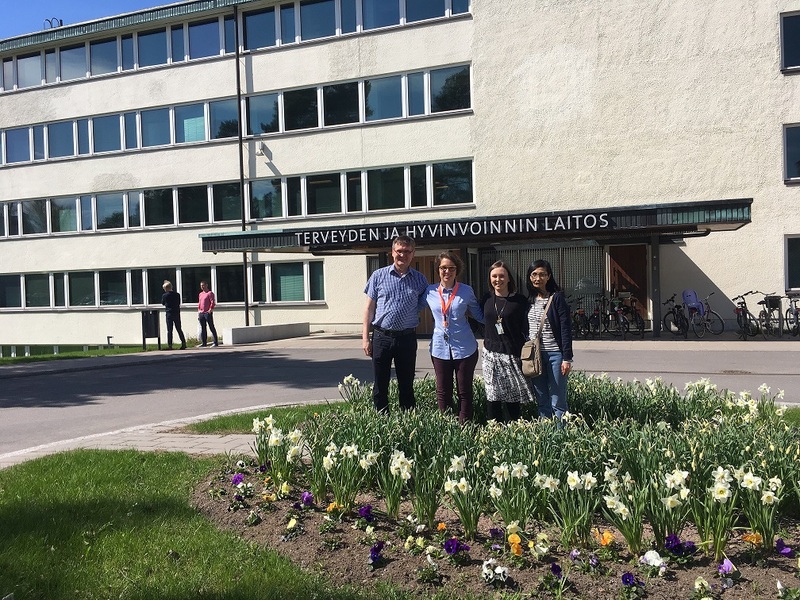 Birgit Trukeschitz and Assma Hajji from the Austrian team and Ismo Linnosmaa, Lien Nguyen and Hanna Jokimaki from the Finnish team presented preference models for their respective countries. The team discussed the strategies and selection criteria used to choose the best fitting models and outlined the robustness checks needed before the results were ready for publication. The meeting ended by outlining proposed plans for each of the workpackages. Here’s to another productive and enjoyable meeting! A short article by Professor Ismo Linnosmaa and Dr Eirini Saloniki has recently been published in the OPTIMI. OPTIMI is a newsletter in health and social economics concentrating on recent research and findings about productivity, effectiveness, costs, finance and incentives in health and social care in Finland. The newsletter disseminates recent research findings to support decision-making at various levels of health and social care. OPTIMI is published four times a year and it is edited at the Centre for Health and Social Economics, National Institute for Health and Welfare, Helsinki. To read the article please follow this link. 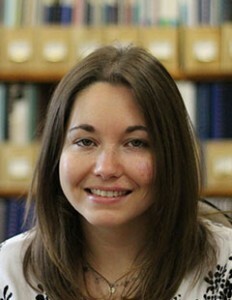 By Eirini Saloniki, Research Associate at PSSRU & CHSS at the University of Kent. It was nine years ago when I was given the opportunity to study for a year abroad at the University of Kent with the Erasmus programme. 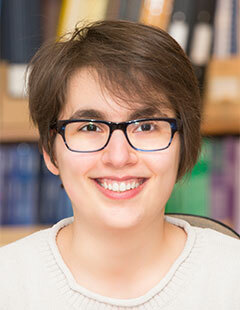 A fantastic and mind-opening experience – in fact, so fantastic that I returned to Kent not only to study for a PhD but now also working at the University. Who would have thought that I will live the Erasmus ‘dream’ again, this time as a staff member? Yes, the Erasmus programme is available for staff too…! I was eager to apply but I had to find a hosting institution first. 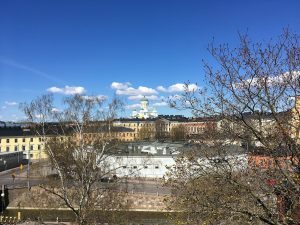 It took a Skype meeting and “I suppose we talk about 2-4 weeks visit?” before I found myself applying to spend two weeks as a Visiting Researcher at the National Institute for Health and Welfare (THL) in Helsinki. The application process was fast and within a couple of weeks I was informed that I was successful. I put my excitement aside and focused on organising everything for the visit with the weather not being a concern as I was told that it will be over 10 degrees in May! Nervous (as it was my first time in Helsinki) but at the same time ready to face the challenge, I spent my first day at the Institute trying to get used to the new routine and working environment, including having lunch at as early as 11:30am. Everyone was very welcome and it really felt like I was a member of the Centre for Health and Social Economics (within THL). The days to follow involved many meetings with health and social economists and late stays at the office (I must have lost track of time as it was so bright in the evening). I had the opportunity to discuss the projects we work on at the Centre for Health Services Studies and the Personal Social Services Research Unit with senior economists, and share best practice. 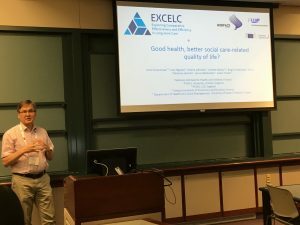 I was also able to share my knowledge of how to control for taste and scale heterogeneity in preference elicitation for social care-related quality of life, and present some preliminary results from the work we are doing in Kent as part of the EXCELC project in an internal seminar. The seminar was well-attended with the audience showing real interest in the project. Importantly, I got to know all about the Finnish health and social care system, and its associated difficulties when it comes to data handling and interpretation. This is an important consideration for the cross-national element of the project that I am involved in. It was a great honour to be asked to co-write (with Professor Ismo Linnosmaa) a short piece about “Measuring effectiveness in social care: the present and future for researchers and policy-makers” which is to be featured in the THL newsletter, distributed across Finland. Before I even realised, my time in Helsinki was over. This experience was invaluable and once again undoubtedly mind-opening. The interaction with senior economists working under a different research environment and the transfer of knowledge as well as discussions for future collaboration were beyond my expectations. Would I do it again? ABSOLUTELY. Lots to learn in this visit but above all lots to gain. I wholeheartedly recommend the Erasmus programme to other researchers. Syksyn 2016 ja kevään 2017 aikana EXCELC -hankkeen kuusi tutkimusassistenttia ovat käyneet kotihoidon asiakkaiden ja omaishoitajien luona eri puolilla Suomea ja haastatelleet heitä heidän elämään ja arkeen, kotihoitoon ja muihin sosiaalihuollon avopalveluihin liittyvistä teemoista. Kenttätyön aikana haastattelijat ovat tavanneet hyvin erilaisia ihmisiä ja päässeet kuuntelemaan monenlaisia elämäntarinoita. Tässä blogissa jaetaan haastattelijoiden kokemuksia hankkeessa tehdyistä haastatteluista. Meidät haastattelijat toivotettiin yleensä tervetulleeksi ja otettiin hyvin vastaan mennessämme tekemään haastattelua. Joskus haastattelu saattoi alkaa jopa valmiiksi katetun kahvipöydän ääressä. Monet haastateltavat kertoivat pitävänsä tutkimusta tärkeänä ja halusivat siksi osallistua siihen. Monet ovat olleet otettuja, kun kuulivat sen, että Terveyden ja hyvinvoinnin laitos (THL) on toteuttamassa tutkimuksen. Hoidettavat ja omaishoitajat sekä läheisauttajat olivat usein myös tyytyväisiä siihen, että heidän äänensä tulee haastatteluun osallistumisen myötä kuulluksi. Erityisesti läheisauttajat tekivät monesti suuriakin järjestelyitä, jotta haastattelu saatiin toteutettua. Läheisauttaja saattoi esimerkiksi asua toisella paikkakunnalla ja tulla hoidettavansa luokse vapaapäivänään sekä avustamaan haastattelussa että olemaan itsekin haastateltavana. Haastatellut kotihoidon asiakkaat ja omaishoitajat sekä läheisauttajat ovat olleet monenkuntoisia. Osa heistä on ollut psyykkisesti tai fyysisesti oikein hyvässä kunnossa, kun taas osa haastatelluista on ollut hyvin sairaita. Haastatteluissa käytetyt kyselylomakkeet ovat melko pitkiä ja vaativia ja monet haastateltavat ovatkin olleet yllättyneitä haastattelun kestosta ja raskaudesta. Tästä huolimatta vain harvoja haastatteluja on jouduttu keskeyttämään kokonaan, vaikka joitakin haastatteluita on tehty useammissa erissä. Myös taukoja on pidetty harvoin kahvittelua lukuun ottamatta. Kyselylomakkeiden elämänlaatua mittaavat ASCOT-kysymykset olivat useimmille haastateltaville haasteellisia. Vaikka useimmat haastateltavat pitivät haastattelua raskaana, vaativana ja pitkänä, olivat he silti motivoituneita vastaamaan kyselyyn. Meistä vaikutti usein siltä, että kotihoidon asiakkaille oli tärkeää saada itse vastata kysymyksiin ja tuoda omat ajatuksensa esille. Joissain tapauksissa esimerkiksi muistisairaiden ihmisten haastattelut täytyi kuitenkin käytännössä aina tehdä jonkun avustamana, jolloin omaishoitaja tai läheisauttaja toimi sijaisvastaajana. Monen haastattelun jälkeen meille on jäänyt tunne, että ihmisillä on ollut tarve päästä puhumaan asioistaan. Haastattelutilanteet ovat olleet merkityksellisiä sekä meille haastattelijoille että haastateltaville. Iäkkäiden haastateltavien tarinat ovat olleet välillä sellaisia, että ne ovat jääneet elämään mieliimme. Etenkin muutamat kovin huonokuntoiset haastateltavat ovat jääneet erityisesti mieliimme. Välillä kotihoidon asiakkaiden yksinäisyys on ollut koskettavaa. Samoin sotaveteraanien ja heidän puolisoidensa kohtaaminen on ollut liikuttavaa. Monellakaan meistä ei ollut aikaisemmin ollut minkäänlaista kokemusta keskusteluista sodassa olleiden henkilöiden kanssa. Haastattelujen kautta on välittynyt kuva siitä, miten paljon hyvää ihmisten elämästä löytyy: on esimerkiksi sukua, joka välittää iäkkäästä läheisestään. Useissa haastatteluissa on myös ollut mukana huumoria ja toiveikkuutta elämää kohtaan. Etenkin haastattelutyön alussa on ollut haasteita erilaisten haastateltavien elämäntilanteisiin tutustuessa ja tottuessa. Me olemme joutuneet ottamaan pitkän kyselylomakkeen haltuun sekä ymmärtämään haastateltavien elämää. Tyypillistä on, että ensimmäisenä tehdyt haastattelut ovat tuntuneet haasteellisimmilta ja jääneet erityisesti mieleen. Työhön perehdytyksestä ja omista odotuksista huolimatta olemme kokeneet haastatteluissa tunteita laidasta laitaan ja välillä haastateltavien tilanteista kuuleminen on tuntunut henkisesti raskaalta. Helpottavaa kuitenkin on, että kymmenet tehdyt haastattelut alkavat sulautua toisiinsa haastattelukokemuksen karttumisen myötä ja haastattelutyö on ajan myötä helpottunut. Useimmista haastatteluista on myös päällimmäiseksi tunteeksi jäänyt hyvä mieli. Usein haastattelun lomassa, tai ns. ”virallisen osuuden jälkeen”, olemme jääneet keskustelemaan haastateltavan kanssa joko kotihoitoon liittyvistä tai aivan muista aiheista. Haastattelutilanteet ja yleiset keskustelut ovat olleet antoisia molemmille osapuolille. Kymmenissä ja sadoissa jo tehdyissä haastatteluissa on saatu arvokasta tietoa iäkkäiden kotihoidon palvelujärjestelmän toimivuudesta. Monet haastateltavat olivat kiitollisia eletystä elämästä ja kiitollisia nyky-yhteiskunnan tarjoamia palveluita kohtaan. Vaikka kritiikkiäkin palvelujärjestelmästä on annettu, on moni iäkäs kiitollinen, että heille tarjottuja palveluita on olemassa. Meille haastattelijoille tämä on ollut tilaisuus kuulla monenlaisia tarinoita haastateltavien elämästä, kuten esimerkiksi sota-ajasta, yksinäisyydestä, sairauksista ja toiveikkuudesta. Työn haastavuudesta huolimatta haastattelutilanteet ovat olleet meille ainutlaatuinen kokemus ja mahdollisuus kohdata erilaisia ihmisiä. Tähän blogiin on koottu EXCELC-hankkeen tutkimushaastatteluista kertyneitä ajatuksia ja kokemuksia Suomesta. Kirjoitus on haastattelut tekevien tutkimusassistenttien käsialaa. Päävastuussa ajatusten ja ideoiden kokoamisesta ja kirjoittamisesta oli Susanna Nevalainen. 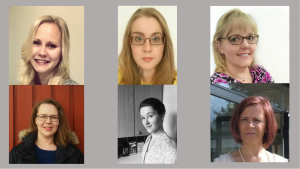 Muut kirjoitukseen osallistuneet haastattelijat ovat: Tuula Kontio, Miina Nikkanen, Maarit Ojanen, Iris Pykäläinen ja Helena Rovamo. EXCELC-hankkeessa kenttätyön osuus on merkittävä. Suomessa hankkeen parissa työskentelevät yllä mainitut kuusi tutkimusassistenttia, jotka haastattelevat yhteensä noin 700 henkilöä: kotihoidon asiakkaita ja heidän omaisiaan ja läheisiään. Haastatteluita tehdään Helsingissä, Espoossa, Vantaalla, Kuopiossa, Joensuussa, Mikkelissä, Kainuun Soten alueella, Eksoten alueella, Tampereella, Hämeenlinnassa, Lahdessa ja Vaasassa. Haastattelijoille järjestettiin yhteinen koulutuspäivä ennen työn aloittamista ja kenttätyön aikana on pidetty säännöllisiä palavereja, joissa on keskusteltu kenttätyön edistymisestä ja haasteista. Haastattelut tehdään useimmiten kotihoidon asiakkaan ja omaishoitajan tai läheisauttajan kotona. Kotihoidon asiakkaiden haastattelut ovat olleet kestoltaan vaihtelevia, noin 1,5?4,5 tuntia; omaishoitajien ja läheisauttajien haastattelut yleensä hieman tätä lyhyempiä. Tutkimuksessa käytetään ASCOT-elämänlaatumittareita. Greetings from America! 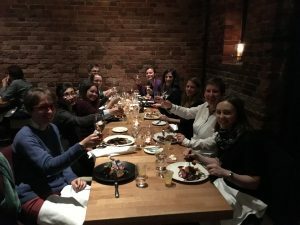 Just a quick update on how things went at ISPOR this week (International Society for Pharmacoeconomics and Outcomes Research – 22nd Annual International Meeting). I gave a talk on our preliminary work on the generation of preferences for the ASCOT-C in the English data, which was well received. I fielded a few questions about how we plan to compare these preferences for the ASCOT-C across countries, so I highlighted our plans for the cross-country analysis using a pooled model. Many people were also interested in when we plan to publish the ASCOT-C work, which is great news! In addition, my presentation had been selected as an ISPOR 22nd Annual International Meeting Research Presentation Award finalist! 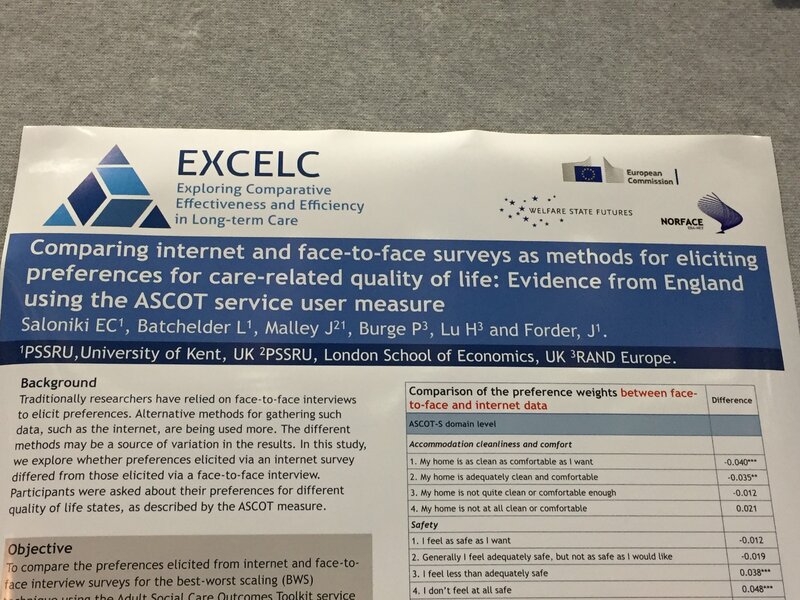 I also presented our preliminary work on the comparison between face-to-face versus internet data for eliciting SCRQoL preferences using the ASCOT-S in the English dataset, which was also well-received. Similarly many were very interested in this work and asked questions about the presentation of the Best Worst Scaling task & how this differed between the two modes. There was also a focus on looking at heterogeneity in a very detailed way (which we plan on doing). Again many people were very interested in ASCOT and when we plan to publish this work, which is great news! In general, I found that there was a lot of discussion talking with others (economists, pharmacists, consultants) after the talk, at the poster, and even in some preference sessions that other methods, such as BWS is the ”way forward” and the ”next step” with eliciting preferences, given it’s less cognitively burdensome and that it provides more detailed information within a profile compared to TTO, which I think is really promising. CHESS are hosting a seminar on ‘Preference elicitation for social care-related quality of life: theory and practice’ on May 17 in the NCC buildings in Helsinki. There will be presentations by members of the EXCELC team, including some early findings from the preference study. The programme for the seminar can be downloaded here. First interviewer experiences from the Austrian team of the EXCELC project. 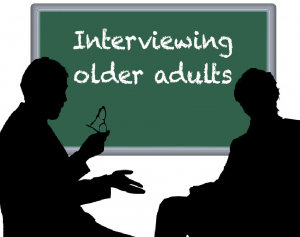 So far, the team of the Research Institute for Economics of Aging has trained 25 interviewers in four of the Austrian ”Laender” to conduct interviews in Vienna, Upper Austria, Lower Austria and Vorarlberg from May 2016 to February 2017. Their task consists of interviewing recipients of long-term care and their informal carers on different aspects of their lives and home care services using a standardised questionnaire. Data collection was supported by the Austrian Federal Ministry of Labour, Social Affairs, Health and Consumer Protection, by social care organisations and local authorities. Most of our interviewers have a background in the social sciences – they come from the fields of sociology, social work, business and economics, health sciences, or even law. Some are still in education and see this as a great opportunity to get some valuable first-hand experience in empirical research. A few of them are employed in the care sector themselves – for them, doing the interviews offers an opportunity to view this field from a different angle as researchers. Two-thirds of our interviewers are women, the interviewers’ ages range from 20 to 55, with most of them being young adults. 14 of them agreed to answer a short survey we sent out asking them about their experiences and impressions. 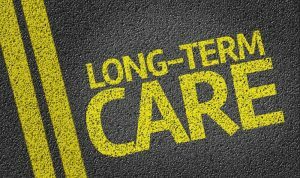 We have collected their statements and used them to put together the following sections on their experiences with conducting interviews with long-term care recipients. Ringing the doorbell, the interviewers don’t really know what to expect on the other side of the door. All they have is a name and some contact details – and about one or two hours of time to get to know the people living within these walls. In many cases, the participants are looking forward to being visited – after all, it’s not every day that a researcher from a university comes over to ask questions about your daily life, and the visits provide a nice break from daily routines. People talk about their lives freely, some offer tea and biscuits. Others would like to, but are not able to cater for guests anymore because of physical strain, illness or economic circumstances. Some are visibly uncomfortable because of this – such as Mr. F, who has “only water to offer” for his guests or Ms. L, who apologises for her scrawly handwriting on the informed consent form. Despite all of this, they are happy to face the challenge and contribute to the research project. For some, however, the willingness to help out is accompanied by fear of the unknown visitors. The interviewers need a great deal of sensitivity and empathy in order to be able to counter-act those feelings, build trust and create a relaxed atmosphere. And in some cases, a familiar person – maybe a son or a daughter – will stay with the participants to make them feel more secure. No two interviews or participants are exactly alike. The interviewers are aware of that and know that with every new interview they are expected to adapt to the situation they find themselves in and to tune into the participant’s needs and react accordingly. “I get to experience so many different settings and have to find ways of adapting to new contexts quickly – I find this really interesting and I feel I can learn a lot from it’” – this was how one of our interviewers put it after having experienced quite a few different interview situations himself. With each interview they conduct, the interviewers get to know different conversation styles. As a result, they constantly develop new skills and strategies in order to successfully lead their counterparts through the questionnaire. The participants signal their needs both verbally and non-verbally – and for the interviewers, they need to interpret these cues and respond by speaking more clearly, loudly, faster or slower. 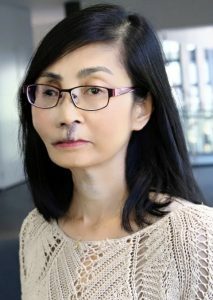 This is what an interviewer noted after having done interviews with two very different participants – the first one very talkative, the second one not so much: “With Mr. A, I had to speak a lot more loudly and articulate very clearly. I also had to repeat the questions several times. Most importantly, I had to be very patient as it took him a long time to answer the question”. Each conversation partner – whether s/he may be reserved, timid, tired, articulate, talkative or upset – requires a different conversation strategy from the interviewer. The first step before the actual interview consists of establishing a connection and feeling of mutual trust between the interviewer and interviewed person. The first few minutes, the short bits of small-talk at the beginning, all of this is essential when it comes to building trust and the basis for open and honest communication. But interviewers also need to make sure that the data collected are as valid as possible: is it, for example, really necessary for the interviewee’s husband to watch over her throughout the entire length of the interview? Is the daughter’s presence critical for her mother to take part in the interview, or is it rather a need for control on her part? The interviewers know that the presence of other people may affect how the person answers the questions. On the other hand, not having someone trusted around may lead to feelings of insecurity or irritation. Once again, it is down to the interviewers’ ability to gauge the situation and find a middle ground, establishing conditions that meet methodological requirements whilst making sure that the participants’ willingness to cooperate is not lost in the process. The interviewers’ experiences show that their visits provide a welcome break from everyday life for the participants. However, positive and negative emotions often lie close together: excitement about the visit, happiness about the fact that someone is interested in their life stories and hope that their concerns are being heard and addressed are mixed with feelings of sadness when talking about burdensome aspects of life, or hesitation and difficulty in finding the right answers. Even though the efforts are usually rewarded, being an interviewer requires a great deal of maturity and groundedness to cope with these kinds of situations. One interviewer notes that, in order for the “message to truly get across”, eye contact between the interviewer and participant is essential. The older persons often do not like being forced into a fixed corset of pre-formulated questions and answers. They find ways to escape these constraints, giving elaborate answers dotted with personal anecdotes and life experiences. Whenever this happens, interviewers and interviewees may find themselves in conflict: while the interviewer may be focused on the questionnaire in the hopes of getting through the interview without taking too many detours, the interviewee may very well see this as an opportunity to have a lively and engaged conversation, to tell stories and share experiences. 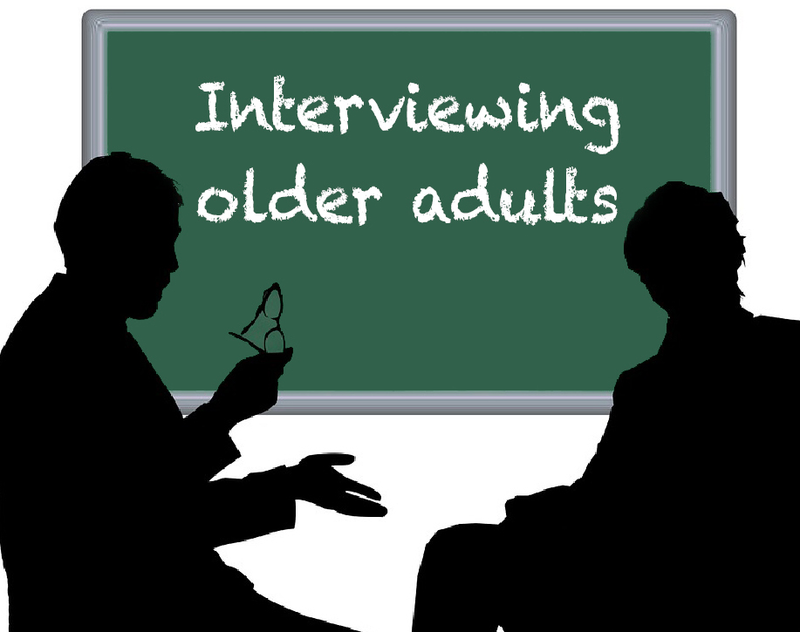 The interview covers subjects related to the respondents’ daily lives, their care situations and quality of life, all of which are very personal topics. It is therefore not surprising that, for some of the respondents, certain questions spark the need to reflect on their personal situation and talk some more. Successfully “conducting” the interviews therefore not only implies being able to get through the survey question by question or block by block, but also to listen empathically and show interest in the respondents and their elaborations. After the interview – what remains? In many cases, the interviewers are left with the positive feeling of having provided participants with a nice little break from everyday life, the opportunity to voice their needs and concerns and be heard and appreciated. “I think giving the interview really made his day”, said one of our interviewers after a visit, or “Ms. M is a charming, humble woman – I believe that the interview has given her quite a bit of confidence”. The field phase in Austria is expected to be completed by autumn 2017. We are looking forward to the results of the quantitative analysis of the data collected, which will be available in early summer 2018. We would like to give a special thanks to: Veronika Böhmer Maria Estella Dürnecker, Stephanie Egg, Stefan Fuchshuber, Lukas Hirsch, Martin Köpplmayr, Judith Litschauer, Franziska Maurhart, Johanna Meditz, Bernhard Prinz, Gerlinde Schröttenhamer, Eva Stiftinger, Andreas Stöger and Philipp Weber.